Figure 1. Bearish Abandoned Baby pattern. 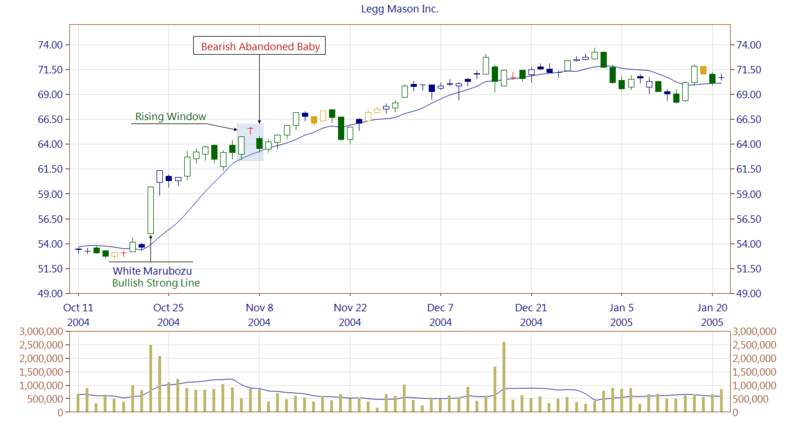 The Bearish Abandoned Baby is a three-line bearish reversal candlestick pattern. Its construction is very similar to the Evening Doji Star. The only difference is that in the case of the Bearish Abandoned Baby the doji candle gaps above the shadows of the candle lines on either side, which is not the case for the Evening Doji Star. The pattern needs to be confirmed, either by breaking the trendline or the nearest support zone. The Bearish Abandoned Baby pattern appears very rarely on the charts hence its practical application is rather low. Figure 2. A Rising Window creates a price gap ($0.17) which is covered by the following candle being the third line of a Bearish Abandoned Baby. The problem is, however, that the pattern is not confirmed on the following candles because the bears were not able to move the market below its first line. The bulls remained control after the Bearish Abandoned Baby occurrence because it was preceded by a strong support zone, formed by a Bullish Strong Line pattern. Additionally the Bullish Strong Line was created at a very high trading volume. The above example again says that the market context in which a pattern appears is very critical. In the case of the Bearish Abandoned Baby it is even more important due to its low frequency. Below you can find some Bearish Abandoned Baby pattern statistics calculated by CandleScanner software.